The workshop provided an opportunity for the free software and hacking crowd to meet one of the foremost specialists on cyber law and Internet governance, Lawrence Lessig. Additionally to introducing fundamental concepts like regulation through code, the workshop addressed two current issues. One was ICANN, the Internet Corporation for Assigned Names and Numbers. The elections of the membership at large to its board of directors is currently under preparation and expected in fall. Jeanette Hofmann gave an introduction to this issue. The other was the decision of the European Commission's DG XV expected in June on whether or not to introduce software patenting in Europe. The introduction here was given by Daniel Riek. The focus of the workshop was on discussion. Lessig, Lawrence, Post, David, Volokh, Eugene (1997): Cyberspace Law for Non-Lawyers. 78 Lessons presented by the Cyberspace Law Institute Washington D.C.
Jeanette Hofmann studied Political Science at FU Berlin. Since 1990 research in sociology of politics and technology at the Science Center Berlin (WZB) and at TU Berlin. 1992 Ph.D. on "Implicit Theories" in technology politics. Followed by work on the digitalization of writing and "User Interface Design" in the framework of the research on the genesis of technology at WZB. 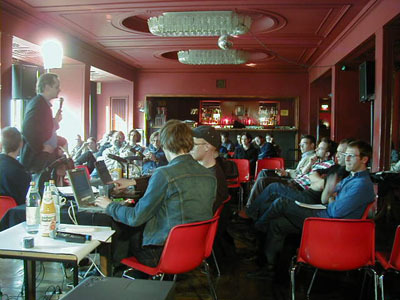 1994 founding of the Projektgruppe "Kulturraum Internet" (Final Report: "Internet... the Final Frontier: eine Ethnographie", Deutsch, English). Empirical Studies on net culture and network organization; case studies on the Internet Protocol and its continuing development. Current research interests: Internet Governance in the narrower sense (ICANN as new Internet government) and in a widers sense (technical and political forms of digital ordering of space). Robert Blokzijl is a founding member of Réseaux IP Européens (RIPE), the European open forum for IP networking. Since its foundation in 1989, he has been chairman of this organization, and was instrumental in the creation of RIPE NCC in 1992 as the first Regional Internet Registry in the world. Prior to this, he has been active in building networks for the particle physics community in Europe. Robert Blokzijl graduated from the University of Amsterdam (1970) and holds a doctorate in experimental physics from the same university (1977). He is currently employed by the National Institute of Nuclear Physics and High Energy Physics (NIKHEF). Rob was selected for the ICANN Board by the Address Supporting Organization. member of the managing board of Linux Verband LIVE. Daniel Riek has been involved with computers since his early years and was already active on Fidonet before he discovered the Internet in 1992 and LINUX in 1993. Free Software btw, was already important in the days of Fidonet. After graduating from high-school in 1993 and concluding his civil service, he started studying computer science in Bonn in 1994, which came to an early end with the founding of ID-PRO in 1997. From 1997 he was managing director of ID-PRO GmbH, and since summer 1999 he is member of the board of ID-PRO AG. Since LinuxTag'99 he is also member of the managing board of Linux Verband LIVE. ID-PRO understands itself as an open source consulting and service corporation, a commitment to free software is part of their concept. Therefore, both in the name of LIVE and in that of ID-PRO Daniel Riek opposes the introduction of software patents.